In small bowl, mix butter, chives, basil and oregano. Cover and refrigerate until serving time. Heat gas or charcoal grill. Remove all but innermost husks from corn. Fold back inner husks and remove corn silk. Rewrap inner husks around corn. Place corn on grill over medium heat. Cover grill; cook 10 to 15 minutes or until corn is tender and husks are slightly brown. Serve immediately with herb butter. Herb butter can be made 2 days ahead. Cover and refrigerate until ready to use. 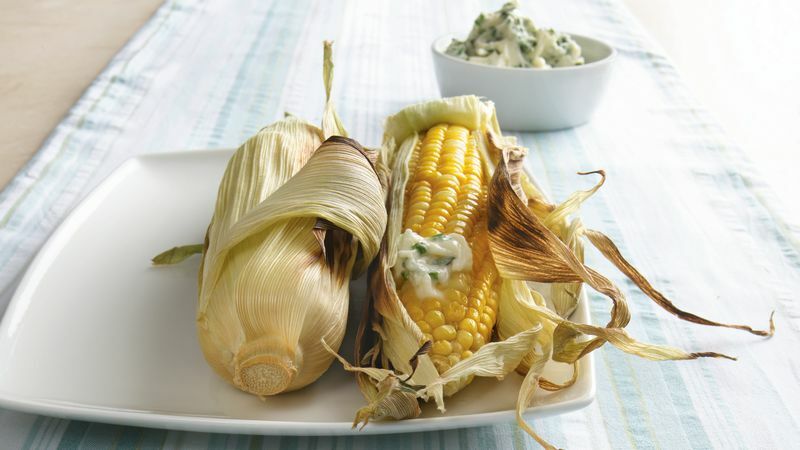 Choose fresh corn that is bright yellow in color with firm kernels that are not shriveled. Use fresh corn within a day or two of purchase. Husks may appear charred even if the corn inside is not. Use oven mitts to hold corn and remove husks before placing corn on serving platter or individual plates.